OpenFaaS functions can be triggered easily by any kind of event. A small piece of code will convert from the event-source and trigger the function using the OpenFaaS Gateway API. The most common use-case is HTTP which acts as a lingua franca between internet-connected systems. This is the default, and standard method for interacting with your Functions. 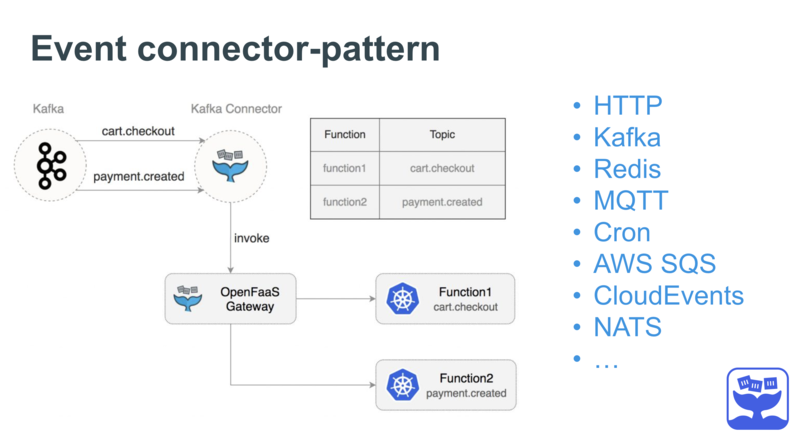 The OpenFaaS connector-pattern allows you to create a broker or separate microservice which maps functions to topics and invokes functions via the OpenFaaS Gateway meaning that the OpenFaaS code does not need to be modified per trigger/event-source. If you'd like to add an event source which is not listed below you can fork the OpenFaaS event connector SDK which is written in Go and use this to connect your pub/sub topics or message queues to functions in OpenFaaS. Connect your function(s) to Apache Kafka topics. Support is available for OpenFaaS Gateways using Basic Authentication. You can use AWS SNS to trigger functions using AWS SNS Notifications and Subscriptions. This approach can be used to export almost any data-source or event from your Amazon Web Services (AWS) console such as S3 of DynamoDB to an OpenFaaS function. You can trigger OpenFaaS functions using Minio's webhook or Kafka integration. CloudEvents is a specification for describing event data in a common way. Follow this example to learn how to trigger functions using the Azure EventGrid and CloudEvents. You can trigger OpenFaaS functions using webhooks sent via the (if this, then that) service. See an example of a function built to forward Tweets from IFTTTT to Slack using Golang: filter-tweets. Visit ifttt.com to learn more. With this project your functions can subscribe to events generated by the changes in your vCenter installation - for instance a VM being created, turned on or deleted. This allows you to extend vCenter's functionality by writing functions to execute each time an event is fired. An example may be tagging a VM with the date it was last turned on or applying a tag showing which user made a change to an object. Invoke functions using Redis pub/sub and the Sidekiq model. Note: the Redis connector currently has no support for gateways using Basic Authentication, but this is being worked on by the author.